MacGuffin: The Atomic Robbery is an affably messed up game. 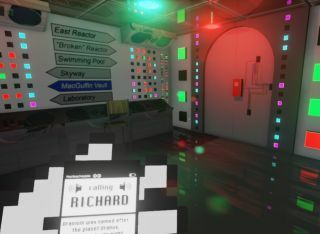 Its first-person comedy approach may seem familiar to fans of Jazzpunk or The Stanley Parable, with a lo-fi, absurdist presentation and kooky, omniscient narrator—but it doesn’t take long for the game to establish an identity of its own. You're tasked with finding the MacGuffin in a dilapidated nuclear plant. Throughout the journey, you get called by, well, Richard Nixon (sort of), who will offer advice, feedback, and general observations on your progress. It's suitably bizarre, like a rabid polygonal fever dream the night after watching a Watergate special and downing too much NyQuil. There are still plenty of bugs and scripting errors that drove me a bit bonkers, but for $3, I can’t say I feel shortchanged. As such, it's hard to recommend wholeheartedly, but there's something to be said for simply exploring a discordant, nonsensical nightmare realm—bugs or not. It's not often that a game so violently and repeatedly tries to pull the carpet out from beneath my feet, and it's the search for something to hold on to (or the letting go completely) that makes a game like MacGuffin so cryptically satisfying. MacGuffin is available directly from the developers and is currently seeking approval on Steam Greenlight.